Former Manchester United striker Ruud Van Nistelrooy has joined Spanish club Malaga on a free transfer. 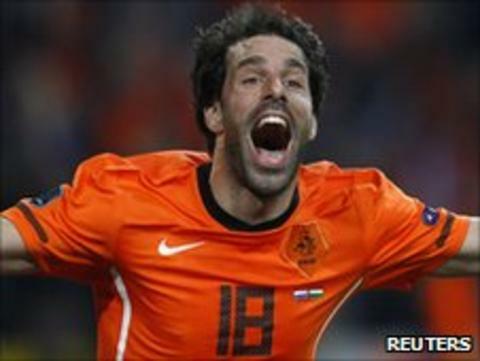 Van Nistelrooy, 34, who previously played in La Liga for Real Madrid, has signed a one-year deal. The Dutchman successfully passed a medical and will be unveiled to the fans on Thursday. He returns to Spain after an 18-month spell at Hamburg SV, where his contract expired at the end of the 2010/11 season. "Throughout my career I have been with many clubs and have shared a dressing room with world-class players. I feel very proud and happy to be here," Van Nistelrooy told Marca. Malaga, who finished 11th last season, were taken over by a member of the Qatari royal family and have outlined ambitious plans to turn the modest Andalucian club into a major footballing force. Having signed ex-Arsenal loanee Julio Baptista and Argentine international Martin Demichelis in the January transfer window, they showed their pulling-power by agreeing a deal with the veteran striker. Van Nistelrooy, a former Holland international who scored 34 goals for his country, has enjoyed a fruitful career having won league titles with PSV Eindhoven, Manchester United and Real Madrid. And he has a prolific record in finding the back of the net, in particular for Premier League champions Manchester United, where he totalled 95 goals in 137 league games between 2001 and 2006.